This new edition of the book by Jean Bruneton has been revised and expanded by over 200 pages, to reflect the most recent advances (natural or semisynthetic substances) as well as the most recent contributions to the therapeutic arsenal (antimalarial, antitumor, or antiretroviral agents). Building upon biosynthetic relationships, the author describes the different classes of metabolites and the drugs that produce them. Organized in four parts (primary metabolites, phenolics, shikimates and acetates, terpenes and steroids, alkaloids), the book develops for each class, phytochemical generalities, distribution, biosynthesis, extraction and quantitation methods, and biological aspects. For each raw material, it presents the origin, identity, production, composition, uses, processing and optimization: thus a considerable amount of botanical, chemical, analytical, pharmacological and therapeutic data is gathered into a particularly coherent compilation, for each product, the therapeutic indications and recommended usage are specified. An extensive index (about 3 000 entries) and nearly 500 recent references represent a valuable starting point for the reader's own lietrature research. 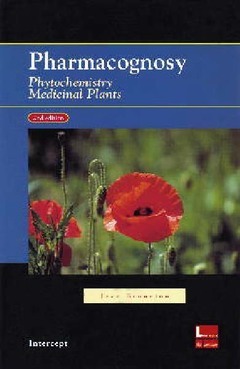 This "encyclopedia" of pharmacognosy and phytochemistry is written for students, educators and professionals using plant resources in pharmacy, cosmetology, perfumery, botany, food technology and other fields.